Featured Image: “I was just trying to give the twirl to his moustache when I suddenly felt an odd sensation. I turned round with my palette in my hand, and there, sitting in my red leather upright armchair, was my father …. I could hardly believe my eyes. I felt no alarm, but I thought I would stand where I was and go no nearer.” – The Dream, 1947 (Painting by Sal Asaro, reproduced by kind permission). The Dream is the most mysterious and ethereal story Winston Churchill ever wrote. Yet the more we know about him, the better we may understand how he came to write it. Replete with broad-sweep Churchillian narrative, The Dream has many references to now-obscure people, places and things. This online version allows us to provide links to all of them. You need only click on any unfamiliar name or term to be linked to an online reference. After reading the story, click here for a thoughtful appreciation by Katie Davenport, a Churchill Fellow at Hillsdale College. Churchill wrote The Dream in 1947, a low point in his political career. Two years earlier, British voters had turned his Conservative Party out of office. The former Prime Minister was now a frustrated Leader of the Opposition. But political reverses often brought out the best in his writing. Churchill’s great war memoir, The World Crisis, began appearing at a similar low point, after he had lost his seat in Parliament in 1922-24. Marlborough, his noble biography, was written in the 1930s, as he grieved over the nation’s failure to heed his warnings about Hitler. The poignancy of The Dream is heightened by the appearance of Winston’s father, Lord Randolph Churchill. Dead in 1895 at the age of forty-six, Randolph had not lived to see, nor indeed ever imagined, his son at the pinnacle of their country’s affairs. Lord Randolph’s own career had lasted scarcely twenty years. Elected to Parliament in 1874, he rose meteorically. By 1884 he was Leader of the House of Commons and Chancellor of the Exchequer. But in 1886 he resigned over a trivial matter, never to rise again. Compared with Winston, Randolph was a footnote in British history. The boy Winston worshiped his father from afar, but never conquered Lord Randolph’s disdain. It was his lifelong regret that his father did not live to see what he had achieved. And it is part of the artistry of this tale that the inquisitive young father of forty is not allowed to know what his seventy-three-year-old son has become. The Dream was conceived during a family dinner at Chartwell, Churchill’s beloved home in the lush Kentish countryside, twenty-five miles outside London. He first entitled the story “Private Article,” showing it only to his family, resisting their urgings that it be published. In his will he bequeathed the tale to his wife, who donated it to Churchill College, Cambridge. On the first anniversary of his funeral, 30 January 1966, it was published in The Sunday Telegraph. The Dream has also appeared as a stand-alone volume in two private printings, and a fine 2005 edition by Levenger Press. Winston Churchill was a man of transcendental powers. He could, it seems, peer beyond reality. Jon Meacham, author of the seminal Franklin and Winston, believes The Dream sheds light on Churchill’s ability to put a better face on things than they really were: to revere a father who overlooked him; to revere Roosevelt, who, in their later encounters, was less than forthright. While vague about the hereafter, Churchill always held that “man is spirit,” and believed in a kind of spiritual connection with his forebears. On 24 January 1953, he told his private secretary, John Colville, that he would die on that date—the same date his father had died in 1895. Twelve years later Churchill lapsed into a coma on January 10th. Confidently, Colville assured The Queen’s private secretary: “He won’t die until the 24th.” Unconscious, Churchill did just that. One foggy afternoon in November 1947 I was painting in my studio at the cottage down the hill at Chartwell. Someone had sent me a portrait of my father which had been painted for one of the Belfast Conservative Clubs about the time of his visit to Ulster in the Home Rule crisis of 1886. The canvas had been badly torn, and though I am very shy of painting human faces I thought I would try to make a copy of it. My easel was under a strong daylight lamp, which is necessary for indoor painting in the British winter. On the right of it stood the portrait I was copying, and behind me was a large looking glass, so that one could frequently study the painting in reverse. I must have painted for an hour and a halt, and was deeply concentrated on my subject. I was drawing my father’s face, gazing at the portrait, and frequently turning round right-handed to check progress in the mirror. Thus I was intensely absorbed, and my mind was freed from all other thoughts except the impressions of that loved and honoured face now on the canvas, now on the picture, now in the mirror. I was just trying to give the twirl to his moustache when I suddenly felt an odd sensation. I turned round with my palette in my hand, and there, sitting in my red leather upright armchair, was my father. He looked just as I had seen him in his prime, and as I had read about him in his brief year of triumph. 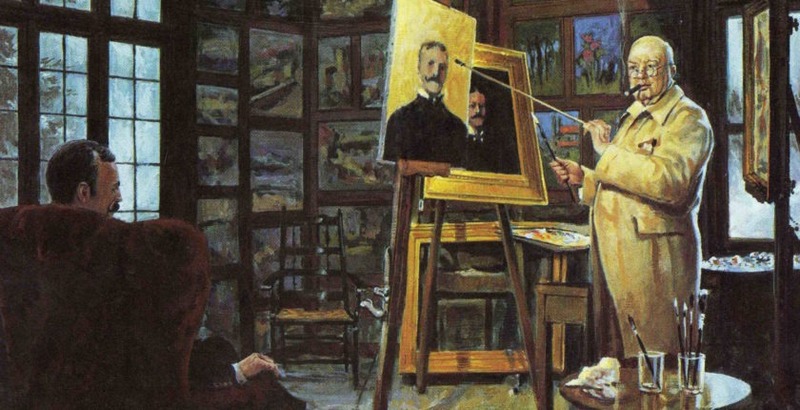 He was small and slim, with the big moustache I was just painting, and all his bright, captivating, jaunty air. His eyes twinkled and shone. He was evidently in the best of tempers. He was engaged in filling his amber cigarette-holder with a little pad of cotton-wool before putting in the cigarette. This was in order to stop the nicotine, which used to be thought deleterious. He was so exactly like my memories of him in his most charming moods that I could hardly believe my eyes. I felt no alarm, but I thought I would stand where I was and go no nearer. “I should never have thought it,” he said. “I only do it for amusement,” I replied. “I really don’t know where to begin,” I said. “Does the Monarchy go on?” he asked. He seemed to be pleased at this. “I always believed in Dizzy, that old Jew. He saw into the future. He had to bring the British working man into the centre of the picture.” And here he glanced at my canvas. “Perhaps I am trespassing on your art?” he said, with that curious, quizzical smile of his, which at once disarmed and disconcerted. Palette in hand, I made a slight bow. After a pause, “You are still a Protestant?” he said. “It did not turn out as badly as I thought,” I said. “You don’t allow them in the House of Commons?” he inquired. “How do you get a living?” he asked. “Not, surely, by these?” indicating the pictures. “Who was the General who beat the Boers?” he asked. He did not seem impressed. “It cost them their life blood,” I said. He gave me a benignant smile. He then took the match to light his cigarette and struck it. There was a tiny flash. He vanished. The chair was empty. The illusion had passed. I rubbed my brush again in my paint, and turned to finish the moustache. But so vivid had my fancy been that I felt too tired to go on. Also my cigar had gone out, and the ash had fallen among all the paints.